Come and join us on a summer sun holiday to the Spanish resort of Costa Del Sol. We stay in the slightly quieter resort of Mijas based right on Butibamba beach and with a host of bars and restaurants for us to explore. Our new 4-star hotel is the perfect place to enjoy some Spanish sunshine with fellow Solos guests! Popular with British holidaymakers for many years, the Costa del Sol’s sheltered coast is shaped by a succession of extensive beaches, hidden coves and fishing villages, and offers plenty to see and do whichever direction you choose. Lying just a 12 minute drive from Fuengirola and less than 30 minutes from bustling Marbella, Cala de Mijas is the perfect place on the Costa del Sol to relax and soak up some gorgeous Mediterranean sunshine. With over 1300m of dark sandy beach to laze upon or stroll along, the week is yours to grab a cooling cocktail or a delicious plate of tapas and watch the world go by. What more could we ask for in a Spanish holiday? Sun and sand mixed with culture and cuisine: take your pick! Our 4-star hotel enjoys a wonderful beachfront location, so if taking time out is the call of the day, flop by the hotel’s swimming pool with a book, soak up the sea views from the terrace or sample some Mediterranean cuisine in the restaurant on site. Away from the hotel, explore to your heart’s content or join an excursion. Why not head up to the white-washed village of Mijas Pueblo for some fantastic views over to Gibraltar? Time away from the sunbed is also on offer with plenty to see on a day out. Why not visit historical Ronda and its amazing views from the Tajo Gorge or take in the highlights of the enigmatic Andalucian city of Granada and its famous Moorish quarter of the Albaicin? 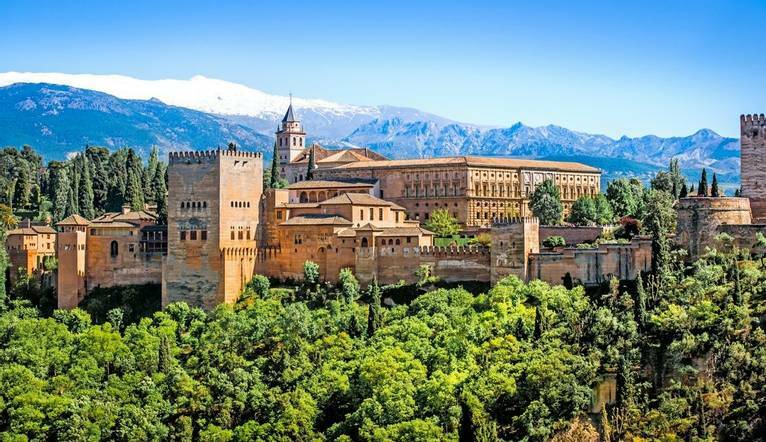 No trip to this beautiful city would be complete without seeing the beautiful Alhambra Palace. An excellent location and a wonderful group. Very well organised, and good accomodation. Located right on Butibamba beach of Cala de Mijas just a few minutes’ drive from Fuengirola and within walking distance of plenty of bars and restaurants, our new hotel on the Costa del Sol is just the ticket for a Spanish beach break. Facilities include a swimming pool, restaurant, bar, coffee house, pool bar, library and games room. Our guest bedrooms all feature air-conditioning, safe (small charge), fridge, satellite TV, hairdryer, free WiFi and come with a side seaview with balcony. The transfer from the Airport to the resort is approximately 35 minutes. We suggest a group collection at the end of your holiday to cover drivers, guides, porters and hotel staff (including restaurant, kitchen and reception staff) of approximately €15 (or the equivalent amount in local currency). Your Tour Leader will collect this on your behalf and distribute it accordingly, thus relieving you of the burden of who, when and how much to tip. The tipping of bar staff and housekeeping will be left to your individual discretion (the rounding up of the drinks bill and a small amount left in your room on departure should cover this and would be much appreciated). As is customary, ‘the hat’ will be passed around for the driver and guide on all optional excursions. For any meals that are not included in your itinerary, restaurants expect a 10Ͽratuity (do check that service has not already been added to your bill). For taxis 10% of the metered fare.